The Sustainable Safety vision is an optimal approach for improving road safety, originating from the Netherlands. It is a vision that is shared by many road safety professionals. A sustainably safe road traffic system prevents road deaths, serious road injuries and permanent injury by systematically reducing the underlying risks of the entire traffic system. Human factors are the primary focus: by starting from the needs, competences, limitations and vulnerability of people, the traffic system can be realistically adapted to achieve maximum safety. More than a decade after ‘Advancing Sustainable Safety’ (2006) it is time to review whether the vision is adequately equipped for a near future until 2030 with upcoming technological developments, further urbanization, ageing, and the search for a new balance in responsibilities. 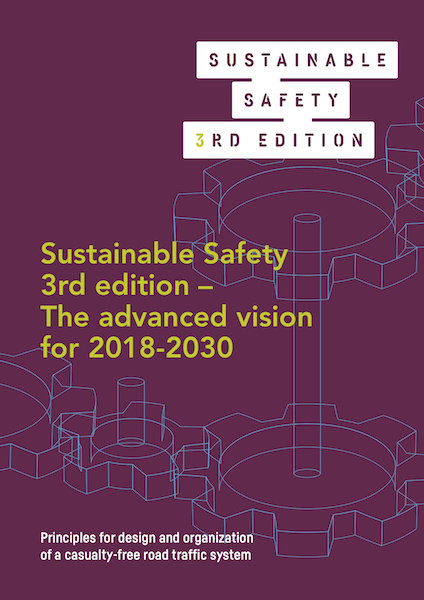 The '3rd edition of Sustainable Safety' (in preparation) briefly describes the recalibration of the vision that was first developed in the nineties, then implemented on a large scale in the Netherlands, and was first updated in 2005/2006. The aim is to systematically work on maximum road safety according to this 3rd edition of Sustainable Safety, in order to achieve a casualty-free road traffic system. In other words, in the end, every road user – be it schoolchild, commuter, commercial driver or active senior – will come home safely!